Ryan Nicholson receives his badge from his wife after he was sworn in as Deputy Fire Chief as Fire Chief Bob Quinn watches. 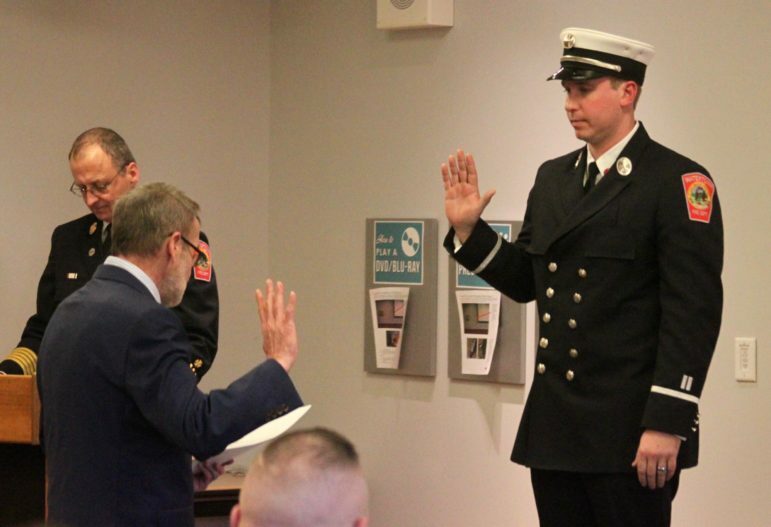 The Watertown Fire Department celebrated the promotion of two of its members, including the newest deputy fire chief, and welcomed four new firefighters at a recent ceremony. The promotions and swearings in took place at the Watertown Free Public Library on Friday afternoon. Fire Chief Robert Quinn announced the promotions and welcomed the new firefighters. All were sworn in by Town Clerk John Flynn. Fire Capt. Ryan Nicholson moved up to the position of Deputy Fire Chief. 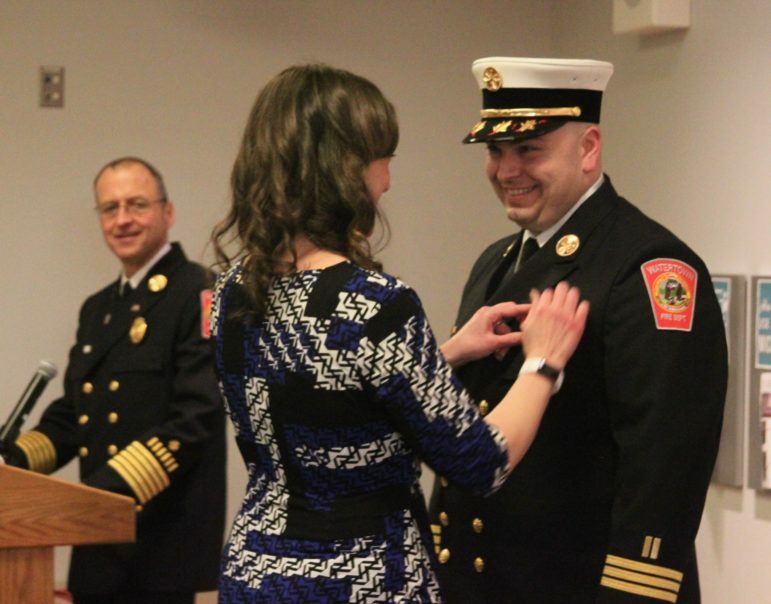 Watertown Fire Lt. Harry Walsh was sworn in at a ceremony on Friday. Nicholson will command Group 2, which had been Quinn’s group until he was promoted to Fire Chief. As Deputy Chief, Nicholson will manage larger incidents and fires and be in charge of multiple apparatus. In the interim, Captain David Melanson had been in charge of Group 2. “He was the senior captain. He filled in admirably,” Nicholson said. Nicholson had been the Staff Service Officer, and before that was the Fire Inspector. He joined the Fire Department in 2006, became a lieutenant in 2011, and made captain in 2013. 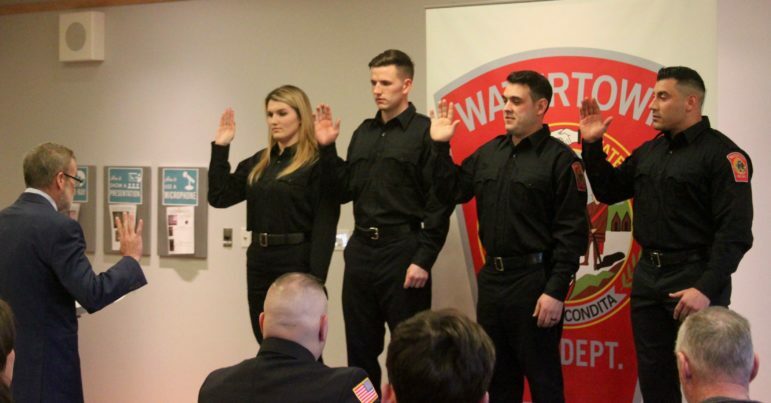 Watertown’s newest firefighters were sworn in Friday: Olivia Winsor, Corey MacDougall, Cory Donahue and Andrew Vega. Also on Friday, Firefighter Harry Walsh was officially promoted to fire lieutenant. He was appointed to be a firefighter 12 years ago and was appointed to be a lieutenant on January 27, 2019. The Fire Department also welcomed Watertown’s four newest firefighters, who officially received their badges. Congratulations to all of you. Thank you for all that you do for us.